This painting-created in the difficult autumn of 1942, hence the shadowy colours with their faint highlights-, forms part of a small series of works in which Morandi used a bunch of zinnias as his model, exploring their gradual withering. We know that Morandi preferred to use silk flowers, made with great skill in 18th-century Bologna, and that after the war he no longer painted fresh flowers precisely because of their transient nature, swiftly subject to the ravages of time, in contrast to the subject of his composition in which he sought a "motionless mirror" in which to reflect his inner vision, the changes in his thoughts and feelings. The model must never change, precisely because it is the artist who changes constantly (and for the same reason, after 1927-1928, Morandi made no further portraits (not even of his beloved sisters), nor did he depict figures. 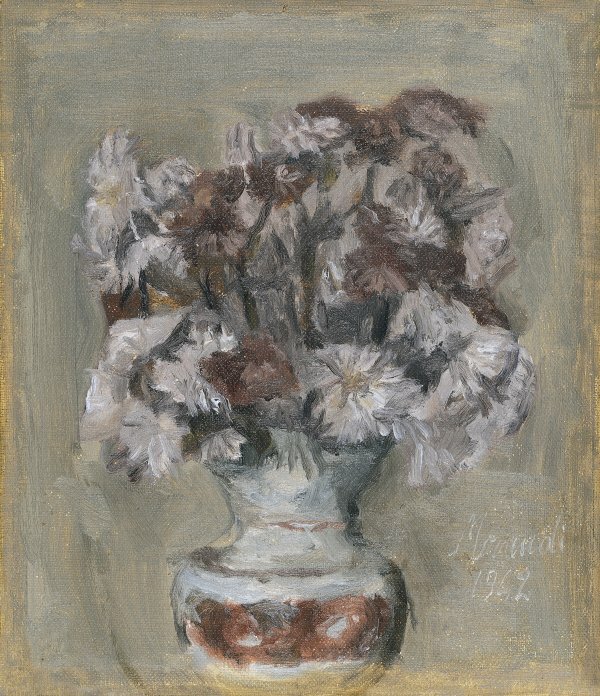 As in the prints of flowers made around 1930 (particularly those devoted to the subject of zinnias in a vase), 1 in the present canvas Morandi accepts the confrontation with the most fragile, ephemeral natural object, capturing it precisely at the point when it passes from full life to rapid, progressive decay. Until a few years ago, the present work was in the same Italian collection as another painting of a similar subject. The two works were exhibited together in various exhibitions organised by the Museo Morandi, precisely in order to emphasise the artist's interest in the expiration of time as seen in the transition from one canvas to the other. In this painting, the first of the two, the flowers are still fresh and the bunch fits snugly into the vase, creating a compact, firm composition. The image is frontal, almost in relief, imposing in its silent presence. In the second painting the vase disappears and the eye concentrates on the drooping stems and the fading corollas which are now more open, discomposed, undone. In the Flowers now in the Carmen Thyssen-Bornemisza Collection, the tense, nervous brushstrokes move the petals as if their skin were caressed by a secret breeze wafting from the background, a decidedly Morandian background in the intensity of the vibration, and the way it imposes itself as a fragment of pure painting, offering itself as the interior domain inhabited by the appearance of the flowers.